Functional Composite Materials are made by combining a resin and filler to produce unique characteristics that cannot be realized by either single material by itself. The material can be formed into shapes by injection molding, extrusion, etc., high functionality, miniaturization, and reduced part weight are the key benefits. Selection of materials that will meet the required functions. Processing of raw materials into the optimum shape. Processing of pulverized materials further into a condition suitable for mixing. Mixing of the processed materials with the resin. Melted resin is kneaded with the mixture of materials. Creation of the desired functional composite material. Performance requirements for next generation vehicles is diversified. Mate's technology offers materials with wide flexibility in formed shapes and functions and offers the industry's No.1 solution to achieving such requirements. Household appliances are continuously evolving towards greater convenience and economy. Mate's material technology creates high performance functional parts for use in these ever increasing innovative products. Quest for digital components that are more precise and functional. High functional composite materials created by Mate support IT technologies towards the future and materialization of the information society. Protection of the earth’s environment is the most important agenda for humankind. Mate's material technology for reduces waste and assists in the creation of clean energy, helping provide both environmental protection and a comfortable life. Mate proposes new values for Functional Composite Materials in response to market needs and customers’ problems to materialize innovative solutions. Supported by elemental technologies, for powder processing, surface treatment, knowhow in designing material mixture, and kneading technology acquired as the leading manufacturer of plastic bonded magnets, Mate offers the most complete line of soft magnetic materials, high specific gravity materials, and other types of functional composite materials. Mate strives for problem free use of our products by maintaining a strict inspection and evaluation procedure based on the customers’ conditions of use. Mate is also committed to environmental protection working towards nonuse of hazardous substances and the elimination of substances of environmental concern. 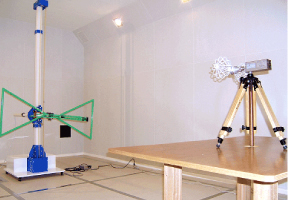 Research and development of soft magnetic materials for radio wave absorbtion as an EMC countermeasure is underway. We are utilizing soft magnetic properties to convert radio magnetic waves to heat and as a magnetic shield allowing for easy magnetization. 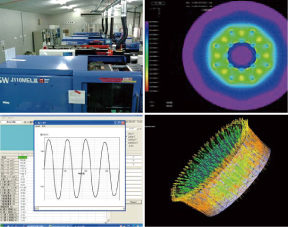 Mate’s expertise and sophisticated measuring instruments leads to early solutions of EMC issues. Our expertise and products make accelerated development possible. Please feel free to contact our EMC Center for effect of countermeasures using wide variety of materials, etc. Because the material being handled is special in nature, Mate provides support at the customer’s site, including advice on molding conditions and assistance in the actual molding operation. Quick manufacturing of the mold to confirm performance during trials, from machining, to the testing stage. Mate assists in the evaluation of the customer’s product with our various molding machines and evaluation equipment. Mate provides advice on equipment suitable for molding plastic bonded magnets in which severe wear is expected. Mate follows up with the customer from the preparation stage of the equipment to start up. Mate conducts magnetic simulations when plastic bonded magnet material is used to support methods of using magnets etc. Depending on the customer needs, Mate can introduce a manufacturer suitable for production of the product. Mate also assists in the study of the assembly process.